I am old. Yes, old. I am old and I like to sleep, a lot. I have a routine and I do not like it messed with. “Then why are you at youth camp?” Good question. I have to be, I’m the youth pastor. Just because I am old and like to sleep does not mean that I do not like to stay up late, it’s just hard to do. It’s even harder to get everyone settled down to bed. II do have a few tricks up my sleeve, and so do a few up my friends to help you avoid the whole “go to bed” tirade. This is a great idea. I have also had campers take turns reading chapters in the book of Revelation with flash light. 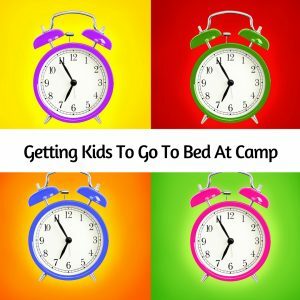 That works pretty well too..
Do you have any tips and tricks to get kids to go to sleep? Getting campers to sleep is definitely not one of my favorite parts of the job. I always had an event on the last night of the week for the campers to look forward to, so on thursday night they knew something big was going to happen. But they had to earn that event, so every night we would say lights out and if we heard any noise they would get a strike, three strikes your out kind of thing. Some of the events would be stuff like a dance party, _____________(your cabin’s name) got talent, or man hunt. Even though this would cost me some sleep on thursday, it allowed me to sleep all the nights before hand. You are a pro Amber. 🙂 Thanks for sharing your wisdom.